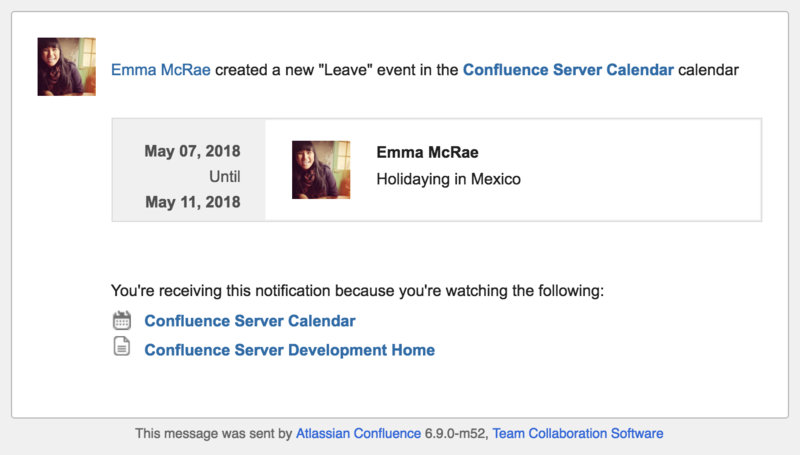 When you watch a Confluence space it includes watching all calendars in that space, so there's no need to manually watch calendars for your team or project. To watch a calendar, choose to the right of a calendar name and select Watch. Notifications will be sent to your email address. You can also stop watching a calendar, if you no longer want to receive email notifications about changes to the calendar. To stop watching a calendar, choose to the right of the calendar name and select Stop Watching. If the menu says 'Watching', you're watching the calendar because you're either watching a page the calendar is embedded on or you're watching the related space for the calendar. To stop watching in this case, you'd need to stop watching the relevant page or space containing the calendar.